New product development (NPD) or new product introduction (NPI) is a business process that needs to be defined and managed just as any other business process. The product development process can be broken into two sub-processes – the management process that covers business strategy, portfolio management, pipeline/resource management, and the phase/stage-gate process and the project execution process that addresses how to develop a new product or service. This is represented in the figure below. The project execution process is normally divided into phases or stages separated by gates or well-defined milestones. This gated process requires a management review to determine that the project is still on-track, the risks are manageable, and the project warrants continued investment. This process is referred to as a phase/stage-gate process. The gate reviews are the intersection between the management process and the project execution process. To support defining this new product development process, we offer a Phase/Stage-Gate Process Definition Workshop. The purpose of this workshop is to develop a phase/stage-gate process to guide new product development projects. The process can based on a predefined process model that embraces industry best practices or we can approach this process definition as a “clean sheet” definition of your NPD process. Define the phase/stage-gate process for new product development. Identify key tasks and milestones. Determine points at which management decision/approval points are needed (gates). Determine phase/stage and gate terminology. Determine phase objectives statements for each phase/stage. Develop full cross functional task plans for each phase/stage. Review relevant project level PD-Trak tools and the client’s existing support tools that relate to this type of project. Assign actions to select/modify/create support tools to be used. Define the gate review process. When will gate reviews be held? How will gate decisions be made? Review PD-Trak gate review support tools. Follow on actions may be required to finalize the task plans and support tools as needed to support the PD-Trak implementation. Marketing – One or two product managers or marketing leaders with a good overall understanding of the front end process of identifying customer needs and opportunities and of the backend process of launching a product. Knowledgeable in current markets being served and current processes used for product line strategic planning, target market definition, product definition, business case development, and launching a product. R&D – One or two technical leaders who can represent the technical departments for which the process will be used. Note that the focus of this process is product development, so there is more emphasis on the D than R in R&D. 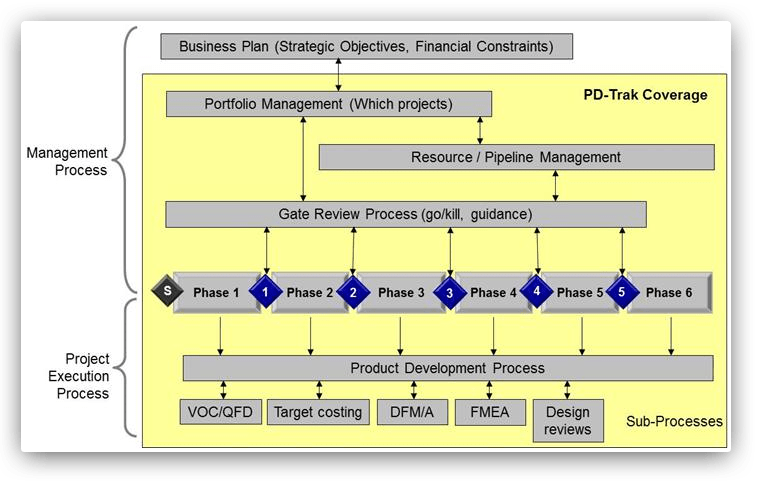 (It is common to have a dedicated stage-phase/gate process for technology development projects which would be developed in a separate workshop). Manufacturing – A technical leader representing Manufacturing Engineering or Process Engineering and an Operations leader who can represent Manufacturing and Production Planning. Purchasing/Sourcing – A procurement manager/leader with an understanding of how Procurement supports the development of a new products, qualification of new suppliers, the procurement of materials to support production, and the acquisition of tooling and equipment. PMO – If a Project Management Office exists, one or more leaders of this function. If a PMO does not exist, then a project manager, project leader or project engineer. Finance – One or more leaders from the Finance group that are in a position to give input to business case development as a key component of the product development process i.e. the methods used for assessing financial attractiveness and managing product costs. The time required for this workshop depends on the scope i.e. how many phase/stage-gate process models need to be developed/defined. The workshop may be limited to simply the definition of the phase/stage-gate process or may include a detailed definition of the gate review process and software support tools. The agenda below is adjusted based on the needs of client’s situation. Identify past challenges with new product development projects. Key elements of a best practice based process. Develop a sequence of basic/essential tasks that cover each primary function. Add tasks needed to provide a comprehensive road map for project execution. Identify points at which gate reviews will occur thereby defining the project phases/stages. Define phase/stage-gate terminology. Check task sequence against best practices (our predefined new product process model) and modify as required. Define primary responsibility for tasks and deliverables. Define phase/stage objectives and gate objectives. Review PD-Trak project level tools and existing tools in use by the client. Identify tools to be used to support the new process. Review standard project documents and PD-Trak templates. Determine which documents are required as part of this process. Assign actions to select/create/modify tools as needed. Finalize document templates. Define the phases in which these documents are deliverables. Review gate review best practices. Agree on gate review process to be followed, including ground rules. Review PD-Trak gate review support tools (e.g., metrics, scoring worksheet, gate presentation, etc.). Assess if defined process and tools will address past challenges. To support the workshop the following are required: conference room with at least one large blank wall, PC projector, flip chart with pens, post it notes with marker pens, and digital camera. The pricing for the workshop can be determined by our standard consulting fees described on our Pricing page. In addition to our fees, we bill actual costs for travel, per diem and other project-related expenses. We require payment within thirty days.